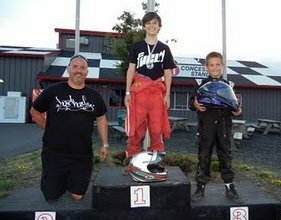 On the first weekend of June 2011, the WKA Divisional New Jersey Sprint Series returned to the very fast and long kart track at NJ Motorsport Park in South Jersey. 12 year old Tazio Torregiani admits this is his favorite track. This is where Torregiani had his worst crash and his best wins, and he came back to win again, in Cadet class. The feature race 1 was very exciting with several lead changes. Bumpdrafting is a big factor here. Your drafting partner at the end also becomes your biggest rival. Tazio grabbed the lead from the pack with only a few turns to go and defended all the way to the finish in first place, with 3 karts right on his tail. Tazio also did well in the Yamaha Sportsman Light class with a third place podium finish. This result, together with a win in the first round, puts the Fairfield County driver in the points lead in this class. Tazio Torregiani would like to send special thanks to Frank Storino, Jeremy, and Mike "Chi Chi" Ramirez for their generous help in working on the Merlin karts. The TazioTorregiani.com Racing Team is brought to you by www.NewCountryPorsche.com, Fuel Clothing, and SteelMX/SMX Optics.